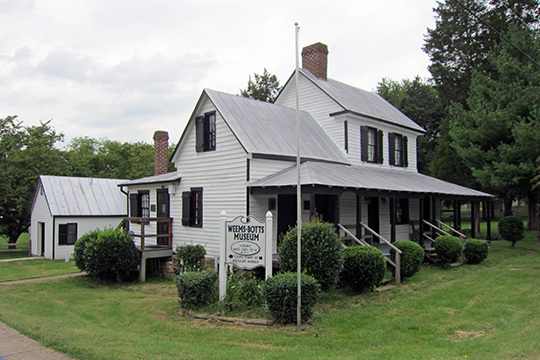 Dumfries Town Hall is located at 17755 Main Street, Dumfries, VA 22026; phone: 703-221-3400. Photo: Weems-Botts House, ca. 1749, Duke and Cameron Streets, Dumfries, VA. Listed on the National Register of Historic Places in 1975. Photographed by user:Leonard J. DeFrancisci (own work), 2011, [cc-by-3.0 (creativecommons.org/licenses/by/3.0)], via Wikimedia Commons, accessed April, 2015. Dumfries is considered to be Virginia's oldest town, chartered in 1749. It was incorporated in 1961. Dumfries history began as early as 1690 when Richard Gibson erected a gristmill on Quantico Creek. A customhouse and warehouse followed in 1731, and many others cropped up along the estuary by 1732. Prince William County was formed and took its name from Prince William Augustus, the second son of King George II of England. Captain John Smith first saw the fair harbor of Dumfries, on Quantico Creek, when he and his crew of explorers sailed up the Potomac River in 1608. About fifty years passed, during which handy pioneers and land speculators were active in claiming land by patent. By 1658, all river front land from Chopawamisc Island to Anacostia Island, on the west shores of the river, had been surveyed and patents issued. It should be noted that most "surveying" had been done from the safety of a vessel, without benefit of going ashore, due to the fear of Indian activity in the area. The Town of Dumfries was formally established on 60 acres of land at the head of the harbor of Quantico Creek, provided by John Graham. He named the town after his birthplace, Dumfrieshire, Scotland. After much political maneuvering, the General Assembly established Dumfries as the first of seven townships in the county. Dumfries received its charter on May 11, 1749 making it the oldest continuously chartered town in Virginia. When Dumfries became the second leading port in Colonial America receiving tobacco from the upland, it rivaled New York, Philadelphia and Boston. Dumfries peaked in size and importance in 1763. For about 15 years Dumfries was a thriving port when several factors brought about its demise: the Revolutionary War, erosion and siltation, and the shift in the main shipping commodity (from tobacco to wheat and sugar). The Town thrived and peaked in size and importance with its finest year being 1763, and for the next ten years, it remained static with little change. The following decade saw a slowdown, and after 1785 the Town's importance continued to wane. Several disastrous fires took a toll on the numerous wood frame buildings and left the Town a mere shell of what it once had been. Much of its commerce, and thus its merchants, had moved to Alexandria and other locations, where the gamble of highly competitive business would not be as significantly affected by the causes of nature, such as the silting of a harbor. About 1796, the remaining merchants of Dumfries realized they could no longer compete with other river ports where shipments were loaded directly from the docks onto deep hulled, ocean going vessels. Siltation of Dumfries Harbor prevented direct loading of ships and required handling of shipments twice—first from the docks to a shallop and then to a ship in deep water. In an effort to overcome this limitation, the merchants decided to build a canal and thus formed the Quantico Creek Navigation Company which sold shares of stock at fifty dollars each. This venture was successful for a time, until a severe storm in the Quantico Creek watershed caused the canal banks to give way, leaving several boats stranded in the mud, and the company abandoned the project. In 1819, after one of the large fires in the Town, a fire protection company was formed, with the most able-bodied men in the Town as members. The post-revolutionary period did not improve, and found the Town trustees selling land for delinquent taxes. Parson Mason Locke Weems, a citizen of the Town, established a book store at the turn of the century, but in 1802 sold the property to Benjamin Botts for use as a law office and residence. The Church of England in America, whose properties had been confiscated after the revolution, reorganized as the Episcopal Church, and shortly thereafter other new denominations were to be found in the area. For the fourth time, the Prince William County court was moved. As result of a shift in population, to Brentsville, and Dumfries lost its lucrative trade of court days and the numerous law offices associated therewith. From 1822 until the Civil War, the Town again, "fell asleep," with the economy being largely agricultural, primarily the growth of wheat. The Civil War brought many changes in military occupation with the Potomac batteries offering much excitement in the fall of 1861, before General Lee moved his line south to the Rappahannock River. This blockade of the Potomac River brought many troops into the area, not only to man the gun emplacements, but to protect the batteries' rear from a Union flanking movement. Record and account books of mercantile establishments of this period, due to the growth of the railroads, show the prime economy to be hand-hewn oak railroad ties. These were traded via a credit receipt, similar to the tobacco economy on the 1700's, to the store keeper, for food and other sundry items. Fishing and fish processing and ships biscuits were also a boon to the economy. These new trades were taken up by the owner of the old plantations, where the odor of drying and salt fish would not create a problem with their neighbors. Salt for the salt fish process came up river in scallops, after unloading from the West Indian traders, in the bay. The ties were taken to First Landing, on Quantico Creek, where they were loaded aboard small ocean-going vessels for distribution up and down the east coast. In 1872 when the Richmond and Potomac Railroads joined at Aquia, railroad ties were then shipped via railroad, thereby making the First Landing dock at Dumfries a ghost shipping point. By the latter part of the 1800's, as a consequence of the loss of major railroads and shipping industries, Dumfries once again slept with its status and importance as a prominent governing body never to be again realized after this time. The Town's main street was a mud hole, and with the advent of the motor car, some members of the community made a living using their farm teams to pull automobiles out of the mud after rain storms. In the 1920s, the old Potomac Path of pre-colonial time—also known as the Kings Highway of the colonial period, the Telegraph Road of the Civil War period, and known today as Main Street and U.S. Highway No. 1—was realigned and surfaced. Route 1 became a major north-south transportation corridor and, to some extent, this brought back the hustle and bustle the Town had formerly known; that is until the construction of I-95 in the early 1960's which provided a new high-speed north-south highway. Officials of the Town of Dumfries, Virginia, Town of Dumfries Comprehensive Plan, 2014, www.dumfriesva.gov, accessed April, 2015.